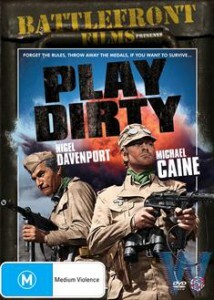 Michael Caine goes fuel-dump a-raiding with a bunch of cynical irregulars led by Nigel Davenport. Quality war adventure. This review was written 45 years too late. Frequently mentioned alongside Robert Aldrich’s classic “The Dirty Dozen” (1967), “Play Dirty” comfortably sits alongside the daddy of WW2-guys-on-a-mission films, albeit dragging a little in places. But it’s a film that lives up to its title, right up to the final scene as the cynical, expendable nature of war is highlighted superbly. It’s the second world war, north Africa, and British special forces want to blow up German fuel dumps to hinder Rommel’s progress. Despite having failed numerous times, an irregular unit made up of prisoners is placed under the command of Caine’s Captain Douglas, though in reality the team actually follow the orders of Nigel Davenport’s Colonel Leech, also an ex-con. The motley crew are, of course, the usual selection of thieves, rapists and ne’er-do-wells, all expendable, and all played by euro actors who learned how to grin and say little from watching too many spaghetti westerns. As a result, there is not much of the camaraderie found in, say, “The Dirty Dozen” as these fellas are here strictly to behave badly. Plum roles are for Caine and Davenport, and they do a good job antagonising each other, with Davenport especially creating the cynical, moustachioed template for Robert Shaw’s Quint in “Jaws”. Caine leaves his Cockney accent behind and tries to be all proper-like and let Leech know who the boss is. One of the enjoyable things of “Play Dirty” is seeing Caine’s captain repeatedly overruled and saved by the criminal Leech. 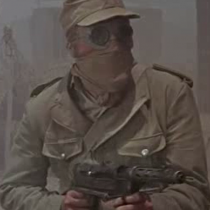 As they plod through the desert, they witness massacres, commit their own, overcome booby traps and generally live up to the film’s title. Elsewhere, his experience doing 2nd unit work on “Lawrence of Arabia” (1962) clearly pays off as his deserts (actually shot in Spain), look daunting and harsh, while the explosions and carnage have an impressive sense of scale. Co-scripted by Melvyn Bragg, but don’t let that put you off.